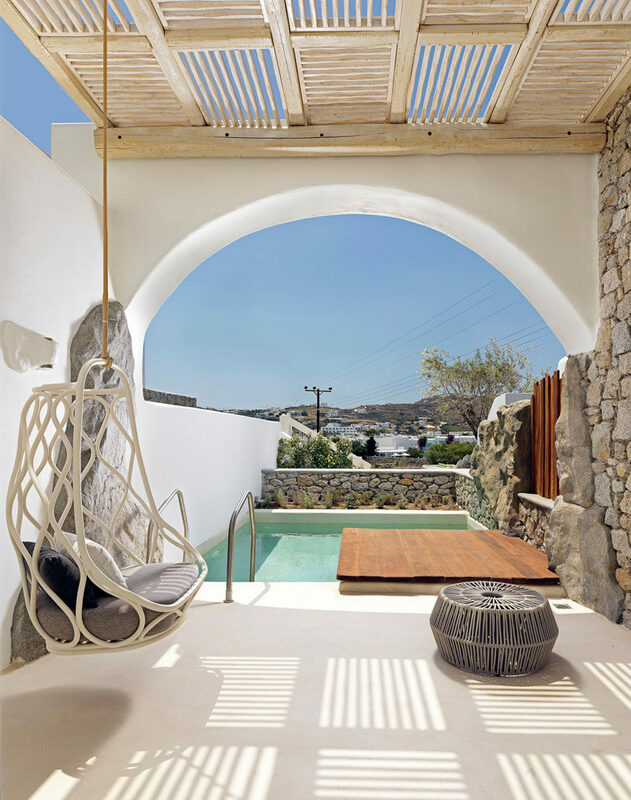 A new hotel has recently opened on the Greek island of Mykonos. 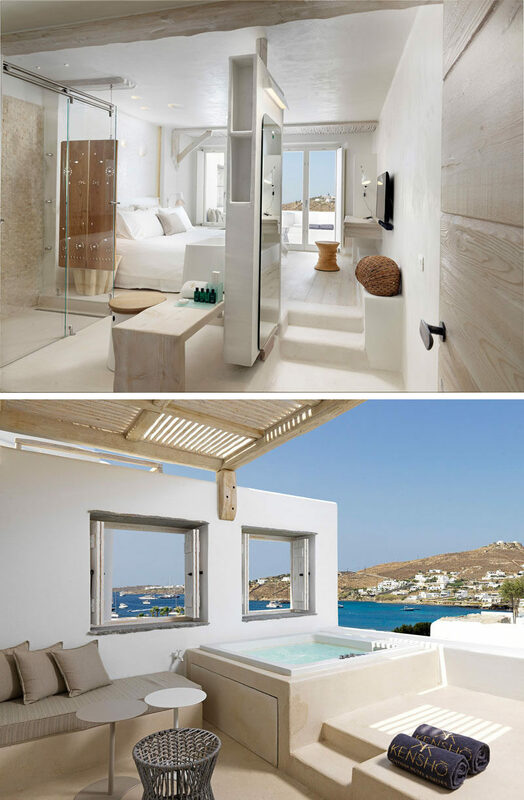 The Kensho Boutique Hotel overlooks Ornos Bay and has a contemporary design thanks to interior design firm CMH. 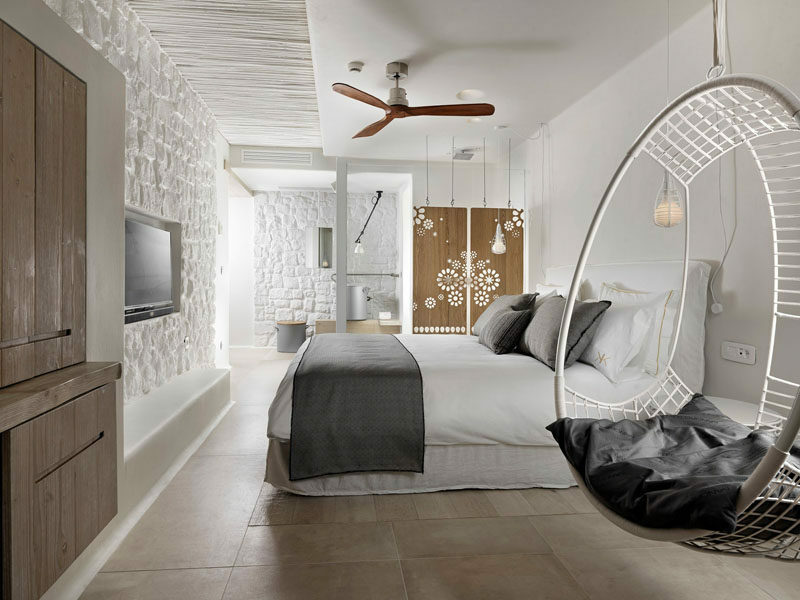 The inspiration for the design of the hotel was the natural beauty of the Cyclades and Cycladic architecture, with the main characteristics of white walls paired with stone and wood found throughout the hotel. 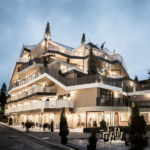 The hotel has a few bars and restaurants, each with their own look and style. This bar, located next to the pool, has carved wooden stools, with a sculptural glass table supported by wood logs. 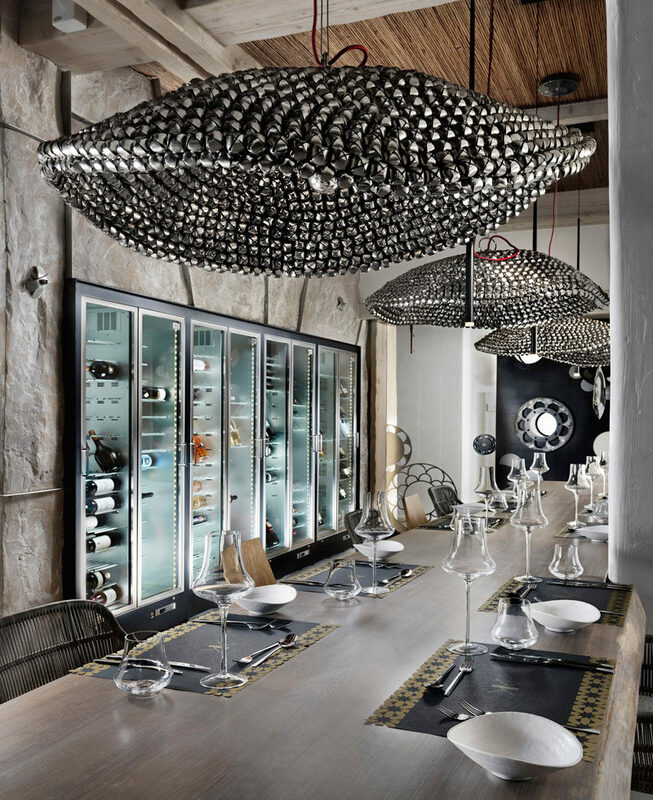 In another restaurant, large sculptural pendant lights hang above the tables, while a large wine fridge sits flush with the wall. 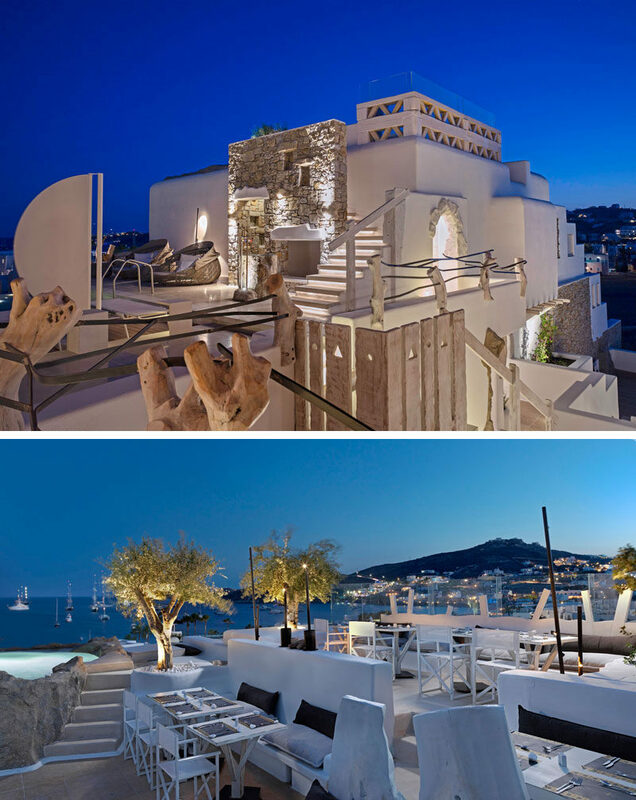 At the top of the hotel, there’s a bar with picturesque 360 degree views of the island. 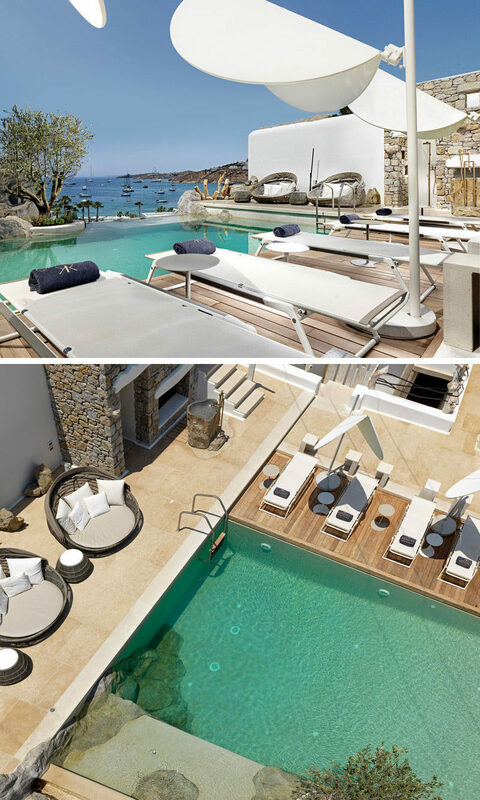 Sun lounges surround the hotel pool that incorpates the natural rock, and also has sea views. Inside the hotel, there’s a spa with steam room and fitness center. 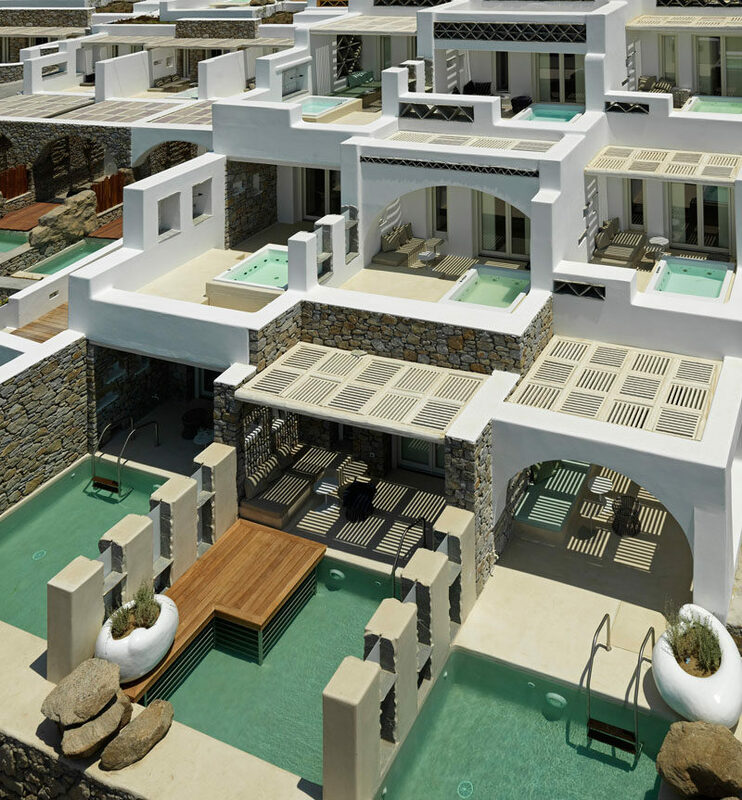 The hotel has just 35 guests rooms with 10 of those rooms being suites. Each room has been designed differently, with the natural stone and aged wood featured throughout. 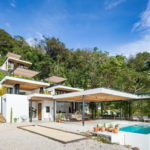 Some of the rooms, like the one above, have a private plunge pool. Other rooms have a smaller spa that sits on a private balcony. In this room, a natural rock wall appears in the bathroom, while the stone wall behind the bed has been painted white to give the space a more contemporary feel. In this guest room, a half-wall separates the sleeping area from the bathroom. Wood elements have been added to some rooms, like these hanging wooden artistic wall panels at the back of the room.